Some Safflower Oil For Your Heart? Safflower is a highly branched herbaceous plant. The seeds of this plant are used for oil extraction, and used as safflower oil in many households. But do you really know what this oil is? Traditionally, this plant was grown to make natural dyes of yellow and red from their brightly coloured flowers. This was used in a time when commercial dyes were not available. The flowers and seeds of this plant were also used to add flavour to food. Today, many brands in the market sell safflower oil, which is extracted from the seeds of this plant. There are two types of safflowers that produce two different kinds of oils. One of the varieties produces oils that are higher in monounsaturated fatty acids, while the other has higher proportions of polyunsaturated fatty acids. The polyunsaturated fatty acids present in this oil include linoleic and linolenic acids (both omega 6 fatty acids). These fatty acids were known to be good for the heart and were used to reduce heart problems in individuals using this oil. But recently, many oils have gained popularity for their omega 3 fatty acid content and have drawn consumers into buying them. The result is the loss of the importance of omega 6 fatty acid. The polyunsaturated fatty acids, linoleic and linolenic acid are known to reduce total and LDL cholesterol levels in the blood. This leads to a decrease in the formation of clots in the blood, leading to a control of blood pressure, and an overall decrease in the chances of heart problems. A study by the Ohio State University on post menopausal obese women, showed that supplementation of safflower oil daily, helped increase insulin sensitivity, decrease the level of HbA1c (a protein that acts as a marker for diabetes) and slightly increased HDL cholesterol levels. These fatty acids also brought about an increase in adiponectin, a protein that helps in regulation of fats in the body. This property of safflower oil can help mobilize fats from the stomach and abdomen area. Isn't that a good property for those trying to shed some weight in these areas? Try it! The high content of vitamin E in safflower oil makes it a good source to fight free radicals in our body that could cause cancer. Many oils, body lotions, sunscreens and soaps contain safflower oil in them. They help to keep your skin supple, soft and look hydrated. Apart from these benefits, safflower oil is also known to benefit individuals suffering from menstrual disorders, circulation problems and breathing problems. 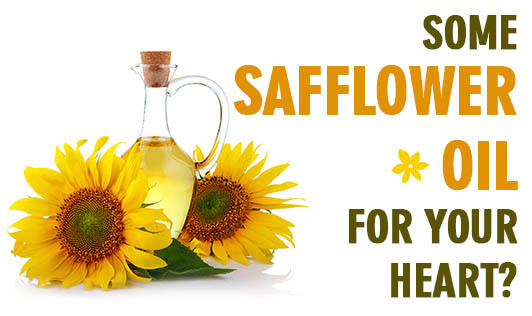 So, here are reasons for you to start using safflower oil. For those of you already using this oil, you may just be happier using it now!